Walking through his hometown of Gyumri, Armenia’s second largest city, 26-year-old Narek Barseghyan still attracts looks from fellow residents for his unruly hair and an earring worn in what still remains a noticeably traditional and conservative society. 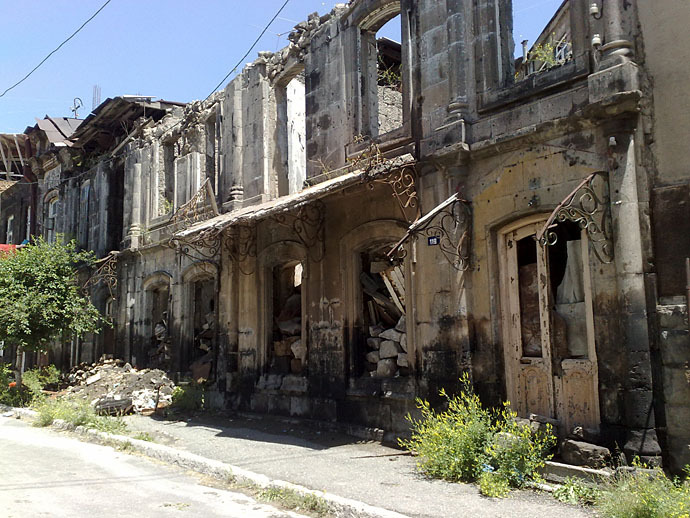 Gyumri is slightly different from the rest of the country, however, and is not only suffering from a closed border with Turkey, but also from the 1988 earthquake which devastated the city. I’ve known Narek, lead guitarist and vocalist with local rock band Bambir for nearly 10 years now and nearly all our meetings and interviews usually end up being drenched in alcohol. It’s rock ‘n roll after all. YEREVAN, Armenia – It’s well past midnight when Narek Barseghyan and Arman Kocharyan, lead guitarist and bassist with the Armenian rock band Bambir, return home. For once, they’ve decided to call it an early night, providing me with the opportunity to interview them over a bottle of vodka diluted down with orange juice. Narek says he feels like drinking screwdrivers tonight rather than the more customary vodka drunk straight. At the very least, it means that it will take a lot longer before speech becomes slurred, and the whole point of the interview is lost. An early Bob Dylan recording is playing in the background as we start to speak about the band in an old apartment building now overshadowed by half a dozen high-rises being built on Yerevan ’s prestigious northern avenue. 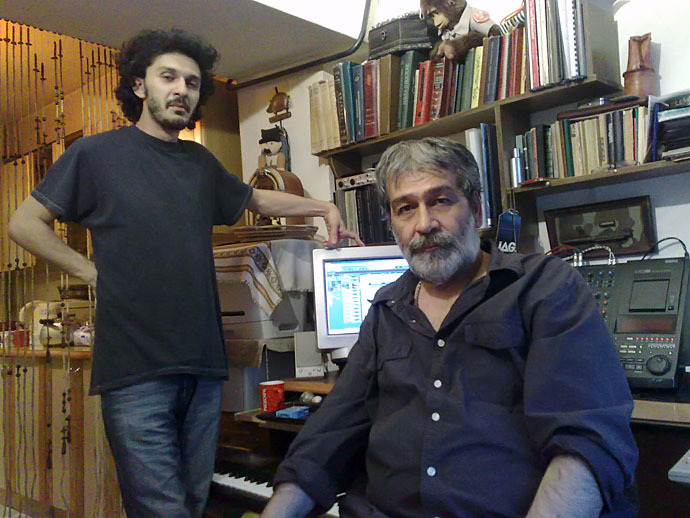 The two musicians have come a long was since leaving their native Gyumri in 2000. They’ve always been dynamic performers on stage, of course, but in recent years the band has matured musically. Now performing on an almost weekly basis at Yerevan ’s Stop Club, Bambir are attracting a sizeable and almost fanatical following in the still largely underground rock scene. Four years ago, short haired and clean cut, the band resembled the stereotype of how most mothers hope their sons will turn out. Nowadays, hair is longer, and Bambir look and live like a rock band. Across the table, Narek lights a cigarette before pouring another cocktail. I’m here to find out more about the band’s history, and to discover what their future holds in store. I can only hope that it all makes sense in the morning. Leaving the DSLR backpack in Yerevan, my Nokia N82 gave me the freedom to feel a little more liberated than usual and also provided me with the opportunity to video interview both Narek and his father as they worked on a new project combining Armenian and Scottish poetry with the national musical traditons of both. 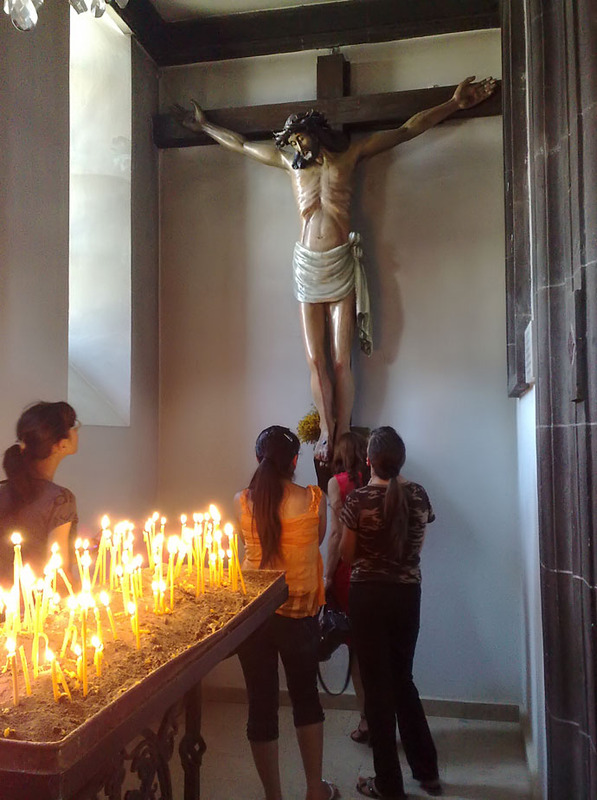 Unfortunately, bandwidth in Armenia is not sufficient enough to upload the much higher quality original. You’ll also have to forgive the casual approach and joke about the light switch, but the fact is it’s impossible to be anything other than informal with Bambir. Uploaded by onewmphoto. – See the latest featured music videos. Want to check out Bambir’s music? The first Bambir fronted by Narek’s father can be heard here, and the new manifestation of the band have a few music videos of songs in Armenian and English to check out on YouTube. Yet, despite knowing Bambir, as well as their fathers – members of the first generation Bambir band formed in 1978 and particularly respected as Armenia’s foremost folk-rock band – this was the first time I’d spend two days with them in their native town. It wasn’t work, but a chance to get away from the chaos and heat of Yerevan. 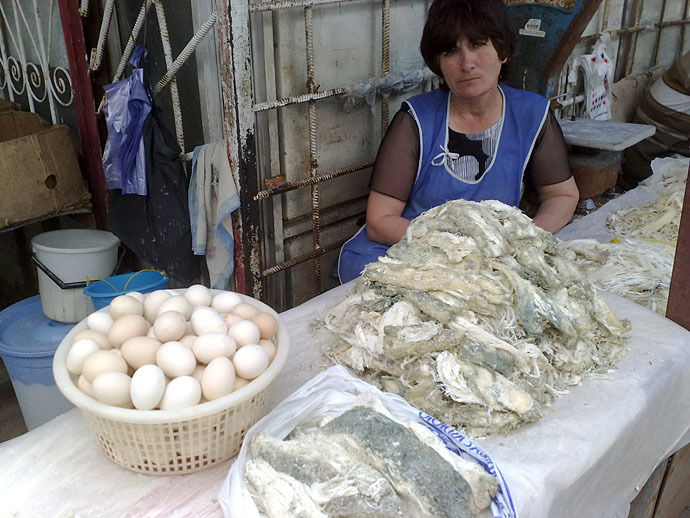 Gyumri, by comparison, is relaxed, laid back and cool. Birdsong can be heard while sitting at the café on the city’s central Square. People can talk instead of being drowned out by the musak blasted out from the dozen generally tasteless cafes, owned by government officials or their relatives, which have completely obliterated what used to be a park near the Opera in the capital. 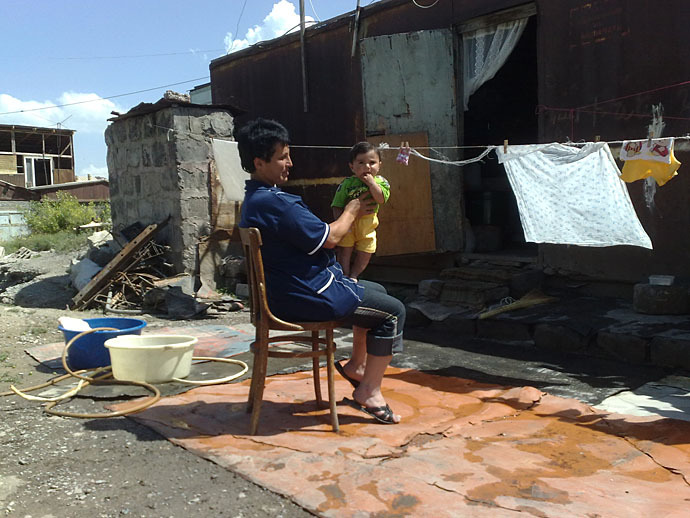 True, Gyumri is still reeling from the earthquake and economic collapse following the collapse of the former Soviet Union. 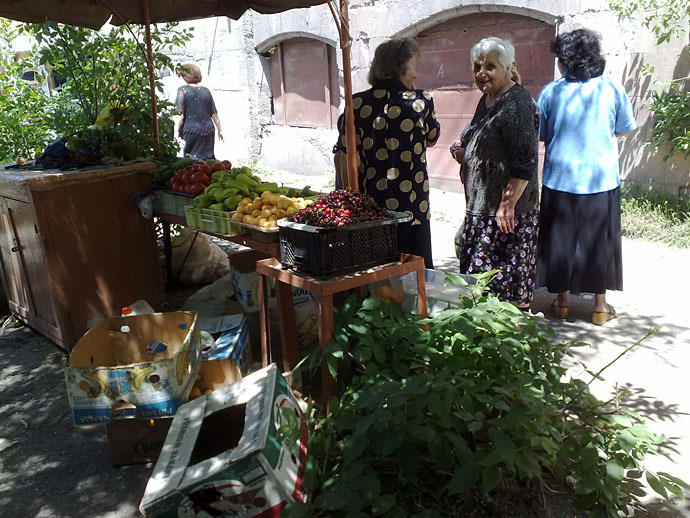 Officially considered to have a population of 120,000 people, many suspect that Gyumri is home to perhaps half of that. 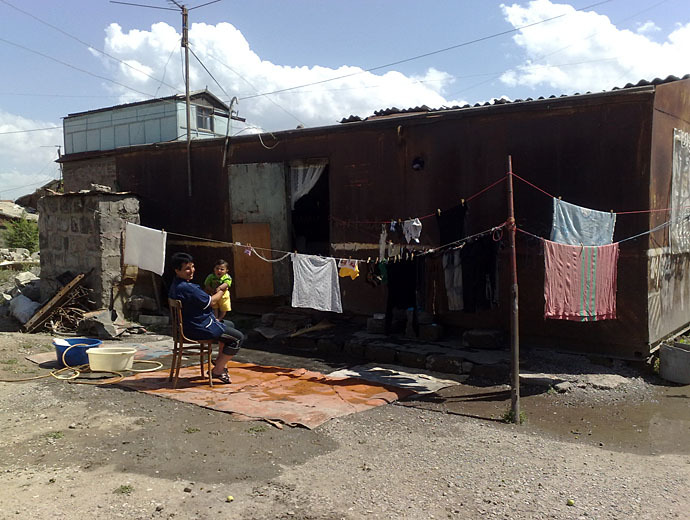 Unemployment is high and corruption as well as the conflict with Azerbaijan over the disputed territory of Nagorno Karabakh frustrated efforts to rebuild the city with international donor money in the early 1990s. 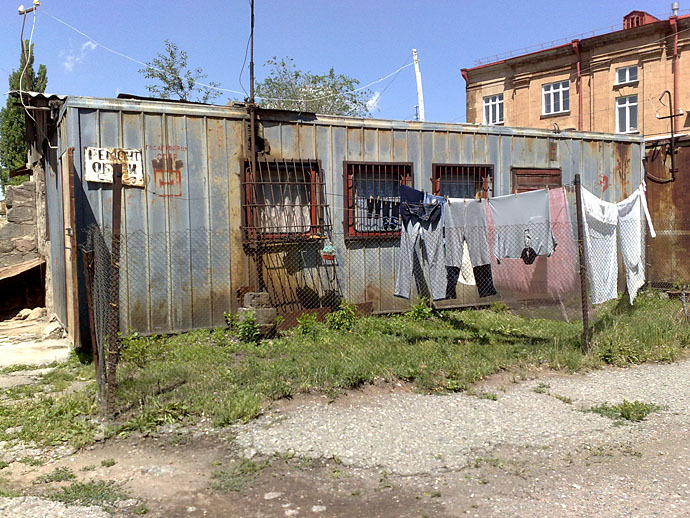 Even today while most families have been re-housed, there are still far too many families living in rusting metal containers in the heart of the city. Cold in winter, they’re like ovens in the summer. 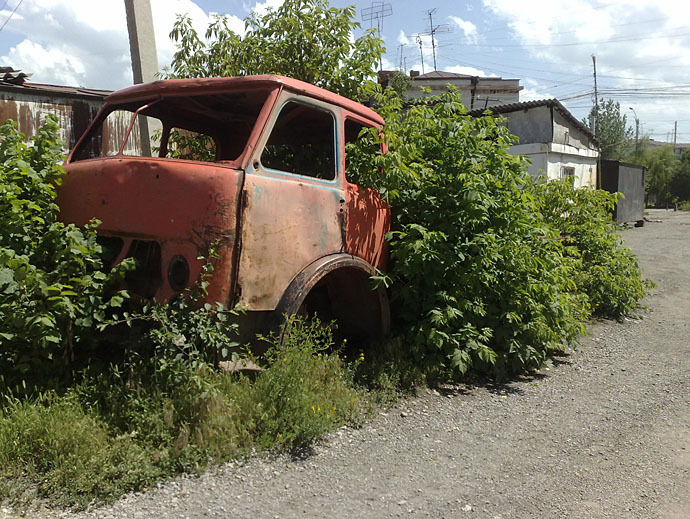 Yet, despite the hardships which are still clearly visible, residents of Gyumri are still renowned for their sense of humour and artistic talents, something that also typifies the second generation Bambir which Narek jointly fronts. They also know how to enjoy themselves and following an interview with Narek and his father, Jag, there was no way to avoid the inevitable – drinking and taking an alternative approach to finding the latest out about the band. Picking up 18 bottles of beer, a bottle of vodka and some moldy cheese, it seemed like a better idea to shoot an impromptu cooking special with the young guitarist as way of introducing outsiders to a little known local “delicacy” – Banir Khash (Cheese broth). inclined. Of course, the Frontline Club is not responsible for any possible side-effects. Do so at your own risk. Unfortunately, my videos posted on this page have been significantly reduced in quality in order to upload. Moreover, a drunken 6am video discussion with Narek on the Caucasus and ethnic conflict as well as culture in the region will have to wait until I find time to split it down into segments small enough for YouTube. Some interesting ideas came out of that, however. Having already expressed an idea to stage a Caucasus Woodstock in Georgia close to the Armenian and Azerbaijani borders, Narek surprised even me with the suggestion of introducing Azeri, Georgian, Farsi and Turkish language classes into Armenian schools. Logical idea if you think about why perhaps French and German are common languages taught in English schools. However, with ethno-nationalism winning out over neighbourly relations, it’s also no surprise why they’re not. Nevertheless, if the Armenia-Turkey border were to be opened, the railroad between Kars and Gyumri would benefit both tremendously, and Gyumri – the name apparently derived from the Turkish word for “customs post” – would perhaps once again be buzzing with guests from throughout the entire region doing trade in the city. Time will tell if such a day is close, but until then some images shot from mobile phone of the city.